From extraordinary superheroes saving the day to everyday adventures with a big orange cat, comic strips can capture the imagination like no other medium. It’s a popular art form that not only entertains but also educates because of how it can show or explain complex stories and concepts using images and dialogue. Use Canva to weave images, text, and emotion together to bring your coolest ideas to life. While it might sound daunting, it really doesn’t need to be. 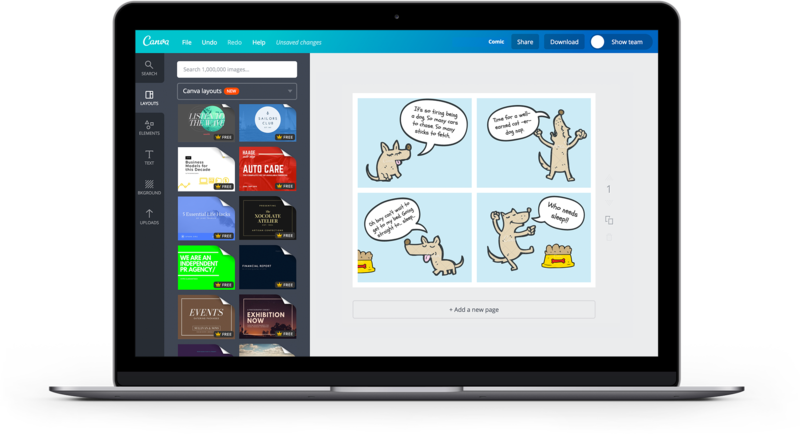 Canva’s comic strips maker is so simple to use that you don’t even need to be a professional cartoonist, artist or designer to create something magical. Whether you’re creating a comic strip for a kid in your life, your parents, or because you think you could be the next big graphic novelist, Canva can help you to create a work of art to be proud of. Who knew designing comic strips could be so easy? Create a new Canva account to get started with your own comic strip designs. When you’re developing a story for your comic strips, chances are you already have a character or two in mind. Have a pen or pencil handy? Great! You can sketch your own creatures, characters and elements to showcase your unique point of view. When you’re done you can simply upload your sketches as images to use in your comic strips. Sketch your characters with a variety of moods and expressions to enhance their personalities, or sketch something quirky that doesn’t yet exist to put an interesting spin on your story. Think flying bicycles, or plants that can talk – the more outrageous the better! With Canva we don’t limit your ability to express yourself and we encourage you to unleash your potential. When it comes to creating comic strips, grids are a fundamental tool you need to work with. Thankfully, Canva’s comic strip templates already come arranged in grids and it’s a simple matter of customization and uploading your own sketches. Working with grids will help you arrange and organize your comics so your story will flow better. Pick from grids of varying number of squares and sizes. You can resize grids easily by dragging their corners. Tip: hold the shift key and drag to keep the same ratio. Then, drag and drop your sketches or images to place them within the grid. You can even fill a grid with up with just a color so you can add some establishing narrative before you get to the action. Canva’s comic strips template allows you to customize your design with ease. Whether you want to create something funny, sentimental or just plain weird, you’ll have access to everything you need to hit all the right notes. One of the easiest ways to convey mood is through your comics’ dialogue. With more than a hundred beautiful and free fonts to use, you’ll be able to convey a whole range of emotions. Ensure your readers know who’s talking by using a speech bubble. Simply search the elements library for “speech bubble” then pick any of the numerous collection of quirky, colorful bubbles. Do I need to download Canva to start designing my comic strip? You won’t need to download or install anything to use Canva. Simply head on over to www.canva.com and create or log in to your account to start creating your amazing comic strip. If you want to download on the go, download our iPhone and iPad apps from the App Store or our Android app from Google Play for free. Collaboration is a useful function if you want to work with a fellow illustrator or editor. To allow other people to edit your design, simply tick the box next to ‘Share/email as an editable design’. This will give them access to edit your design in their personal Canva account. How can I upload my own sketches or illustrations? You can upload your own sketches or illustrations and use them to create your comic strip. Head to the Uploads tab in your object panel, ensure that your Uploads folder is selected then click on the green “Upload your own images” button. Select the file you wish to upload from your computer. All your uploads will be saved on your Uploads folder, ready to be used on your next design.